Delicious seafood, smashing beer and good times were shared at this year’s Ontario Oyster Festival. People were packed in the alley beside Rodney’s Oyster House (469 King St. W.) with early lines extending all the way across the front of one of Toronto’s premiere oyster pubs. You could smell the seafood in the air as people pawed their way through lobster, oysters, mussels and beer. “I really like seafood and I like the summer and I like Toronto. So I came out and had some beers with some good friends and I’m just rockin’ out,” says Ian who withheld his last name. He thought his level of drunkenness might be too unprofessional for the microbrewery he works for, which was on tap at the festival. He wavered slightly where he stood but maintained a bright smile as he spoke. The Ontario Oyster Festival has been around for 24 years or since Rodney’s Oyster Shack was in its former location at Adelaide and Jarvis. The first Ontario Oyster Festival began with about 150 people in a little parking lot. 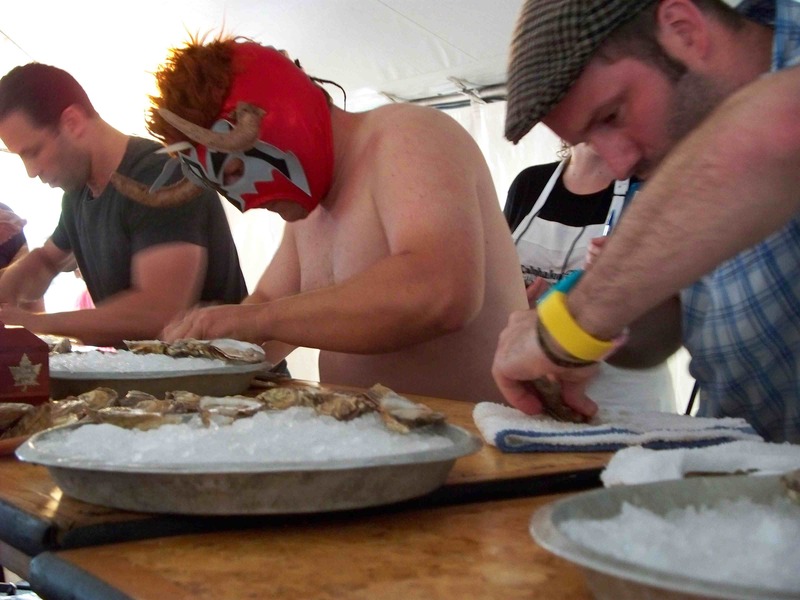 Bands played, beers poured and the event was capped off with oyster shucking. The festival has mostly remained the same, though it has grown significantly. This year the organizers even started to pre-sell tickets to the event, which now includes multiple beer vendors. Clark says they sold out their 400 pre-sale tickets and sold another 500 tickets at the door. For $35, ticket-holders got two drinks and a plate of oysters. Environmental Defence has been working with Rodney’s Oyster Shack since the festival’s humble beginnings and is still a beneficiary. The organization set up a tent near the entrance and spread their message about the state of waterways. “Our water quality has gotten so bad that people don’t trust the water right here where they live. They don’t trust it enough to swim in it or to even drink it,” says David Donnelly, legal counsel for Environmental Defence. Donnelly says he wants people to realize that we’re all connected to the issue and we have to strive for better water practices. At the event, Environmental Defence was touting their Blue Flag Canada campaign. They’ve marked bodies of water on a map with blue flags to show that the source of water is clean and safe. Over the years Rodney’s has donated thousands upon thousands of dollars to the charity to ensure there will still be seafood for his restaurant and a carnival atmosphere at festivals in later years. This year the oyster pub handed over a big cheque for $16,184.92 to Environmental Defence. Shannon Fitzpatrick, a seasoned Oyster Festival partier, hung out in a poncho with other water proofed friends while the rain washed other people in under the big tent. Undaunted by the rain, she and her friends were able to keep a table in the crowded alleyway. Fitzpatrick’s come out in support of Rodney’s and Environmental Defence for several years now.